With prayer, with humility of spirit tempering his temerity of mind, man has always sought to define the nature of the most important fact in his experience: God. To this unending effort to know God, man is driven by the noblest of his intuitions — the sense of his mortal incompleteness — and by hard experience. For man’s occasional lapses from God-seeking inevitably result in intolerable shallowness of thought combined with incalculable mischief in action. Modern man knows a great deal about the nature of the atom. But he knows almost nothing about the nature of God, almost never thinks about it, and is complacently unaware that there may be any reason to. Theology, the intellectual system whereby man sorts out his thoughts about faith and grace, enjoys much less popular appeal than astrology. With its “devolutionary theopantism” 1 and “axiological eschatology,” 2 theology is jaw-breakingly abstract. And its mood is widely felt to be about as bracing as an unaired vestry. Worthy Habit. This is scarcely strange, since among millions of Christians religion itself is little more than a worthy mental habit, socially manifested in church attendance often more sporadic and much less disturbing than regular visits to the dentist. Under the bland influence of the idea of progress, man, supposing himself more & more to be the measure of all things, achieved a singularly easy conscience and an almost hermetically smug optimism. The idea that man is sinful and needs redemption was subtly changed into the idea that man is by nature good and hence capable of indefinite perfectibility. This perfectibility is being achieved through technology, science, politics, social reform, education. Man is essentially good, says 20th Century liberalism, because he is rational, and his rationality is (if the speaker happens to be a liberal Protestant) divine, or (if he happens to be religiously unattached) at least benign. Thus the reason-defying paradoxes of Christian faith are happily bypassed. Catastrophic Paradoxes. And yet, as 20th Century civilization reaches a climax, its own paradoxes grow catastrophic. The incomparable technological achievement is more and more dedicated to the task of destruction. Man’s marvelous conquest of space has made total war a household experience and, over vast reaches of the world, the commonest of childhood memories. The more abundance increases, the more resentment becomes the characteristic new look on 20th Century faces. The more production multiplies, the more scarcities become endemic. The faster science gains on disease (which, ultimately, seems always to elude it), the more the human race dies at the hands of living men. Men have never been so educated, but wisdom, even as an idea, has conspicuously vanished from the world. It was a good deal easier to see that Tennyson was silly than to see that the attitude itself was silly. That was the blind impasse of optimistic liberalism. At the open end of that impasse stood a forbidding and impressive figure. To Protestantism’s easy conscience and easy optimism that figure was saying, with every muscle of its being: No. 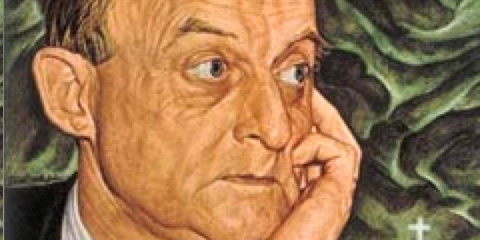 His name was Reinhold Niebuhr. He was an Evangelical 5 pastor, a professor of applied Christianity at Manhattan’s Union Theological Seminary, an editor of Christianity and Crisis, Christianity and Society, contributing editor of the Nation, and an ex-Socialist who was still unflaggingly active in non-Communist leftist movements. He was also the author of countless magazine articles and eleven books on theology. His magnum opus, the two-volume Nature and Destiny of Man, was the most complete statement of his position. Dr. Niebuhr was one liberal Protestant who had indeed heard the Voice out of the whirlwind. It spoke the thought of three God-tormented men: Russian Novelist Fyodor Dostoevsky, Danish Theologian Soren Kierkegaard, and Swiss Theologian Karl Barth. World War I ended the age of liberalism. More than half a century before it ended, two men had felt that it was ending. They were Fyodor Dostoevsky and Sören Kierkegaard. Both men were pessimists. To Dostoevsky, the human situation was a tragic drama. To Kierkegaard, it was a tragic argument. Both men felt that the anguish of human experience, the truth of man’s nature and God’s nature and the relationship of God and man, could be grasped only by a new dimension of perception. Against liberalism’s social optimism (progress by reform) and the social optimism of the revolutionary left (progress by force), Dostoevsky asserted the eternal necessity of the soul to be itself. But he discerned that the moment man indulged this freedom to the point where he was also free from God, it led him into tragedy, evil, and often the exact opposite of what he had intended. In human terms there was no solution for the problem of evil. This insight Dostoevsky dramatized on a scale of titanic tragedy in The Brothers Karamazov and The Idiot, and of titanic comedy in The Possessed. Kierkegaard too was obsessed with “the ultimate potentialities of the human soul.” And like the great Russian, the great Dane was haunted by the tragic sense of life whose full implication only the presentiments of religious faith could grasp. Karl Barth, too, heard the Voice from the whirlwind. But this time the Voice spoke in the tones of cannon. During World War I, Barth was a Christian Socialist and pastor of a small Swiss Reformed Church near the Alsatian frontier. As he preached, on quiet Sunday mornings, about the fulfillment of God’s intentions as evidenced in human progress, the thump and slam of German and Allied artillery punctuated his periods. It caused him, said Barth, acute embarrassment. It also caused him 1) to doubt that the will of God was being fulfilled by man’s good works, or could be; 2) to re-examine the Bible, where, to his surprise (since he, too, had been an optimist), he discovered that most of the principal characters shared his new pessimism about human nature. God, Barth decided, was above and beyond all human effort. Between man’s purposes in history and God’s purposes in eternity was what Kierkegaard had called an “infinite qualitative difference.” Man, said Barth, cannot define God by talking about man, in however loud a voice. God is ganz anders—wholly different. Theology of Crisis. Earth’s “neo-orthodoxy” was called the “theology of crisis.” By crisis, Barth did not mean the present crisis of Western civilization. He meant, like Dostoevsky, that permanent crisis in which man lives. The relationship between God and man, said Earth’s neo-orthodoxy, is a one-day affair; it proceeds always from God to man, never from man to God—the desperate situation that Franz Kafka dramatized in The Castle (TIME, April 28). Between the ages of God’s revelation in Christ and His final judgment, man must live by faith and wait upon God’s will for that grace which He alone can bestow. Barth and his theology have both undergone changes. But his importance as a prophet of the new orthodoxy and the crisis of the soul are best reported in his own disclaimer: he merely climbed the steeple to get his bearings. No one was more surprised than he when, in the darkness, his hand touched the bell rope and the great bell of prophecy began to toll. Reinhold Niebuhr heard the bell. Though the term “neo-orthodox,” applied to himself, makes him wince, Niebuhr matured in the climate of crisis. Though he charges Barth with a paralyzing pessimism and a Bible worship that amounts to obsession, Niebuhr shares Barth’s view of the perpetual crisis of the soul and Kierkegaard’s “infinite qualitative difference” of God. The Logic of Paradox. Orthodox Protestantism by & large subscribes to a body of beliefs among which are: that man is by nature inevitably evil, partaking of the original sin of Adam; that salvation is by faith alone, that good works are meritorious but not essential; that grace is God’s gratuitous benevolence; that the Atonement is the redeeming power of Christ’s incarnation, suffering and death; that the end of history will be the Last Judgment. Reinhold Niebuhr’s new orthodoxy is the oldtime religion put through the intellectual wringer. It is a re-examination of orthodoxy for an age dominated by such trends as rationalism, liberalism, Marxism, fascism, idealism and the idea of progress. It is customary to say that Niebuhr’s books are hard reading. But any person of average patience can find out what he is saying in The Nature and Destiny of Man. Like Karl Earth’s, his method is dialectic; that is, he sees in paradox not the defeat of logic but the grist of an intellectual calculus—a necessary climbing tool for attempting the higher peaks of thought. The twists & turns of his reasoning and his wary qualifications are not hedging, but the effort to clamber after truth. He knows that simplicity is often merely the misleading coherence of complexity. Niebuhr’s overarching theme is the paradox of faith — in St. Paul‘s words: “The substance of things hoped for, the evidence of things not seen.” But Christian faith is a paradox which is the sum of paradoxes. Its passion mounts, like a surge of music, insubstantial and sustaining, between two great cries of the spirit — the paradoxic sadness of “Lord, I believe; help Thou mine unbelief,” and the paradoxic triumph of Tertullian‘s “Credo quia impossibile” (I believe because it is impossible). The Singular Animal. But basic to Niebuhr’s doctrine is another paradox—the lever of his cosmic argument and that part of his teaching which is most arresting and ruffling to liberal Protestantism’s cozy conscience. It is the paradox of sin. Sin arises from man’s precarious position in the creation. Man, says Dr. Niebuhr, has always been his own greatest problem child—the creature who continually asks: “What am I?” Sometimes he puts the question modestly: “Am I a child of nature who should not pretend to be different from the other brutes?” But if man asks this question sincerely, he quickly realizes that, were he like the other brutes, he would not ask the question at all. In more exalted moods, man puts the question differently: “Am I not, indeed, the paragon of the creation, distinctive, unique, set apart and above it by my faculty of reason?” But man has only to observe himself in his dining, bath and bed rooms to feel a stabbing sense of his kinship with the animals. This paradox is related to another. Sometimes man boasts: “I am essentially good, and all the evils of human life are due to social and historical causes (capitalism, communism, underprivilege, overprivilege).” But a closer look shows man that these things are consequences, not causes. They would not be there if man had not produced them. The Transcendent Animal. “The obvious fact,” says Dr. Niebuhr, “is that man is a child of nature, subject to its vicissitudes, compelled by its necessities, driven by its impulses, and confined within the brevity of the years which nature permits its varied organic forms … The other less obvious fact is that man is a spirit who stands outside of nature, life, himself, his reason and the world.” Man is, in fact, the creature who continually transcends nature and reason—and in this transcendence lies man’s presentiment of God. Man’s world is not evil, for God, who is good, created the world. Man is not evil, because God created man. Why, then, does man sin? But man does not always sin by denying his finiteness. Sometimes, instead, he denies his freedom. He seeks to lose himself “in some aspect of the world’s vitalities.” This is sensual sin. The paradox of man’s freedom and finiteness is common to all great religions. But the Christian approach to the problem is unique, for it asserts that the crux of the problem is not man’s finiteness—the qualities that make him one with the brute creation—but man’s sin. It is not from the paradox that Christianity seeks to redeem man; it is from, the sin that arises from the paradox. It is man who seeks to redeem himself from the paradox. His efforts are the stuff of history. Hence history, despite man’s goals of goodness, proliferates sin. There are other perils — a dissolving perspective of paradox. Man’s knowledge is limited, but not completely limited, since he has some sense of the limits — and, to that degree, transcends them. And, as he transcends them, he seeks to understand his immediate situation in terms of a total situation — i.e., God’s will. But man is unable to understand the total situation except in the finite terms of his immediate situation. “The realization of the relativity of his knowledge subjects him to the peril of skepticism. The abyss of meaninglessness yawns on the brink of all his mighty spiritual endeavors. Therefore man is tempted to deny the limited character of his knowledge, and the finiteness of his perspectives. He pretends to have achieved a degree of knowledge which is beyond the limit of finite life. This is the ‘ideological taint’ in which all human knowledge is involved and which is always something more than mere human ignorance. It is always partly an effort to hide that ignorance by pretension.” This is pre-eminently the sin of the 20th Century. He achieves, but he knows no peace, because higher possibilities are revealed in each achievement. In all his anxious acts man faces the temptation of illimitable possibility. “There is therefore no limit of achievement in any sphere of activity in which human history can rest with equanimity.” History cannot pause. Its evil and its good are inextricably interwoven. Says Niebuhr: the creative and the destructive elements in anxiety are so mixed that to purge even moral achievement of sin is not so easy as moralists imagine. This original sin, infecting the paradox in which man asserts his freedom against his finiteness, and complicating with a fatality of evil a destiny which man senses to be divine, is the tissue of history. It explains why man’s history, even at its highest moments, is not a success story. It yawns, like a bottomless crater, across the broad and easy avenue of optimism. It would be intolerable without faith, without hope, without love. No. 1 Theologian. The intricate architecture of his thought explains why even Roman Catholic theologians respect Dr. Niebuhr. Both Catholics and Protestants may disagree with this or that aspect of his doctrine, or bypass or reject it as a whole. Few care to challenge it. Clearly it is not a faith for the tender-minded. It is a faith for a Lenten age. Even those who fail to follow all the sinuosities of his reasoning must sense that, whatever else he has done or left undone, Niebuhr has restored to Protestantism a Christian virility. For, in the name of courage, which men have always rightly esteemed in one another as the indispensable virtue, he summons Protestants to seek truth. The Man. The elaborator of somber paradoxes is something of a paradox himself. Hawk-nosed and saturnine, Reinhold Niebuhr is, nevertheless, a cheerful and gracious (though conversationally explosive) man. An intellectual’s intellectual, he nevertheless lectures and preaches with the angular arm-swinging of a revivalist. An orthodox Protestant, he is one of the busiest of leftist working politicians — a member of the Liberal party. For his gloomy view of man and history does not inhibit hL belief that man should act for what he holds to be the highest good (always bearing in mind that sin will dog his action). Reinhold Niebuhr was born (1892) in Wright City, Mo., where his father, who emigrated from Germany when he was 17, was an Evangelical pastor. Young Niebuhr never intended to be anything else but a minister. Though he lacked any degree, he succeeded in 1913 in enrolling in Yale Divinity School (they were short of students, he explains). Two years later, in a burst of his usual energy, Niebuhr had his B.D. and M.A. To help support his mother, he took his first and only parish, in a dingy district of Detroit. Niebuhr had intended to stay a couple of years. Instead, he stayed 13. His congregation on the first Sunday consisted of 18 souls. 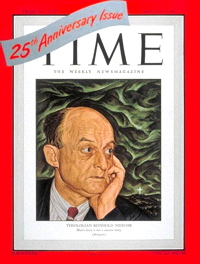 To eke out his salary ($50 a month), Niebuhr began writing, and out of necessity discovered his vocation. At Union his reception was cool. But soon his classes were among the most crowded in the seminary. He moved from class to class surrounded by disputatious students, who soon called him “Reinie.” In 1939, Niebuhr became the fifth American 6 to be invited to deliver the Gifford Lectures at Edinburgh University. Niebuhr drew the biggest crowds in Gifford history, later published the lectures as The Nature and Destiny of Man. Now he lives strenuously at the seminary with his British-born wife, the former Ursula Keppel-Compton, and their two children, Christopher, 13, and Elizabeth, 9. Mrs. Niebuhr, a theologian in her own right, was the first woman to win a First in theology at Oxford. She has lectured on religion at Barnard College for six years. In summer, the Niebuhrs rusticate at Heath, Mass., near the Vermont line. There Niebuhr writes and rests, after his fashion, from the nervous pace at which he drives himself. The Liberal. Most U.S. liberals think of Niebuhr as a solid socialist who has some obscure connection with Union Theological Seminary that does not interfere with his political work. Unlike most clergymen in politics, Dr. Niebuhr is a pragmatist. Says James Loeb, secretary of Americans for Democratic Action: “Most so-called liberals are idealists. They let their hearts run away with their heads. Niebuhr never does. For example, he has always been the leading liberal opponent of pacifism. In that period before we got into the war when pacifism was popular, he held out against it steadfastly.” He is also an opponent of Marxism. Niebuhr’s chief contribution to U.S. liberal thinking, his friends say, is keeping his fellow liberals on the path of the pos sible. “You don’t get world government,” he once said, “by drawing up a fine constitution. You get it through the process of history. You grow into it.” The feelings of his fellow theologians are more mixed. Some criticize his failure to think and act in terms of the church or to generate ideas that would help to counteract modern irreligion and immorality. Others find his ideas of sin too grandiose, too remote from the common tares of mankind. Some feel that he could do with more human warmth and less intellectual incandescence.